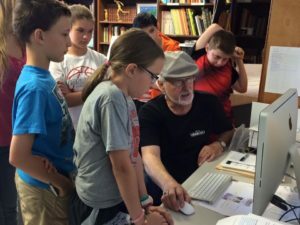 SHAC Volunteer Bob Eisnaugle does some artist research using the internet with students at Art Camp. • Sharing the Markay and SHAC posts on Social Media to spread the word about the great things happening in the arts. • Help sound/lighting tech: sound/lights. VOLUNTEER TIME: 5 hrs. Times listed above are approximate, and vary per need, per show. This is not an exhaustive list. If you are aware of an event and you would like to help please let us know.